Gearbox Software has launched Borderlands: The Pre-Sequel's holiday event. Special Mercenary Day activities will be available to all players for the next two weeks. "Happy Mercenary Day! Much like the citizens of Pandora, folks on Elpis love to take time every year celebrate the holiday season with generosity, giving, and murder," Gearbox announced. "From today until January 5th, you’ll be able to celebrate right along with them in a brand new in-game event available for free to all players." Holiday-themed enemies can be found at the R&D Facility and Pity's Fall. They're wearing wreaths, gift wrap, and other fashion accessories of the season. The most notable foe in Mercenary Day, however, is Odjurymir. This Kraggon can be found out in Serenity's Waste in a cavern called Pyroclast Grotto to the south of the fast travel station. His cave is the place where you normally find Iwajira. Odjurymir seems to have similar abilities. He throws boulders at you that can explode and spawn smaller Kraggons. His other big attack is a long-range ice beam. Should you wander into melee range, he'll try to bite you or smack you with his tail. If you defeat Odjurymir, you could earn a unique Vladof assault rifle called Ol' Painful. This rifle is guaranteed to cause incendiary damage. While the Ol' Painful uses normal assault rifle ammunition, it actually shoots laser bolts. You can watch it in action here: Shopkeepers will be in a giving mood during the holidays. They'll be selling ammunition for 25% cheaper than normal. Players will also find that Elpis has been decorated for the holidays. Some of these decorations have loot hidden inside so be sure to check them all out. 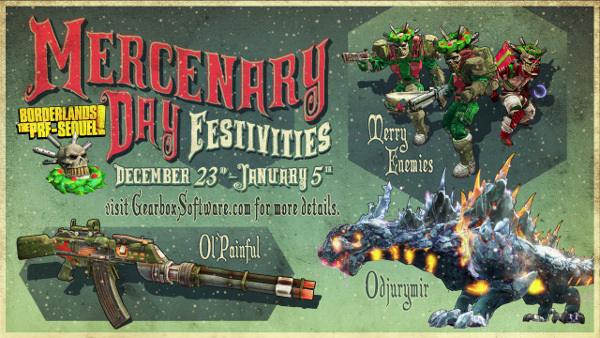 Odjurymir, the ammo discount and everything else related to Mercenary Day will remain in the game until January 5th. I hope that the holiday celebration is followed by an event where Mr. Torgue forces the Vault Hunters to go back to the gym to work off the weight they earned during the holidays. Probably not going to happen, though. Borderlands: The Pre-Sequel is set between the events of Borderlands and Borderlands 2. Players take on the role of mercenaries employed by Hyperion Corporation's Handsome Jack to establish control over Pandora. A later DLC pack allowed them to play as Jack as well. 2015 could bring some exciting news for Borderlands fans, though. A retailer listing suggested that Gearbox is creating a remake of the original game for PS4 and Xbox One. Perhaps they'll get around to announcing Borderlands 3 at some point, too.